View of King's College Chapel in Cambridge. It is a magnificent example of a late medieval Royal Chapel in the Gothic Perpendicular style. It was built between 1446 and 1515 and can be compared to other chapels built in the same period at Westminster Palace, Eton College and Windsor. They all have tall narrow proportions and a front with soaring turrets. 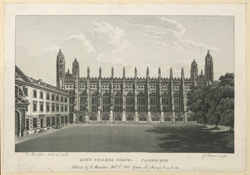 Unlike other Cambridge Chapels it was not built as part of a courtyard range but stands apart from the other college buildings. It is 94 foot high.